Eligible candidates can attend Airmen Recruitment Rally at Anna Stadium, Race Course, Tiruchirappalli, Tamil Nadu from 20th May 2017 to 24th May 2017.Candidates required to register themselves from 6AM to 10AM on same date of rally.Candidates must carry Pencil, Eraser, Sharpener, Gum, Stapler, Blue/ Black pen, 7 recent passport size photographs, 4 sets of attested photocopies and original SSC, Intermediate memorandums, Residence proof, NCC Certificate, Consent from etc. along with them. 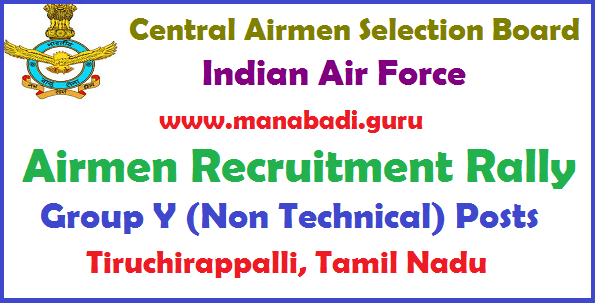 #All Eligible and Interested candidates can attend Airmen Recruitment Rally at Tiruchirappalli from 20.05.2017 to 24.05.2017.